“Perspectives on the Myanmar Peace Process from 2011-2015” is a collection of narrative insights of national peace process actors. The aim is for national actors to step back and reflect on the extraordinary developments in the peace process that took place between 2011 and 2015. This book addresses the urgent need to document these experiences in order to better understand the country’s complex and rapidly shifting peace process. This is in line with our general approach at swisspeace to give space to national actors to reflect on their processes and to share their views in order to nourish the following phases of their national efforts. This publication contributes to that idea. We wanted to draw perspectives from the government, ethnic armed organizations and members of Myanmar’s civil society engaged in the formal peace process. We chose this approach to illuminate the complementarity of individual efforts that drove the process forward. The authors are all Myanmar national actors, whose reflections and personal insights are based on their deep involvement in the peace process. They were selected in close consultation with peace process actors (national and international) on the ground. We recognize the risk of bias in interview selection and are aware of our position in this undertaking as international actors supporting national actors. A key element of the interviewee selection process was based on access and trust. We also sought out actors who were in positions of leadership in the process to gain knowledge about internal and personal dynamics. After more than 60 years of conflict, the Myanmar government and ethnic armed organizations started to engage in peace talks in 2011. Over the past several years, Myanmar has witnessed a series of landmark events, including the signing of a ceasefire agreement with 8 out of a 16-member coalition of ethnic armed organizations; a historic general election in November 2015, resulting in a landslide victory for the National League for Democracy; and the formation of a new government, which, for the first time in half a century, will comprise a majority of people without a military background. Myanmar’s peace process is characterized by complexity: the sheer number of actors and groups involved in different constellations of representation; the change in government at a pivotal point in the process; no formal third-party intervention; and the peace process being embedded in a broader political and economic transition. Despite these factors, the majority of Myanmar national actors pushed for one track and one process. We would like to highlight the views, roles and goals of different actors to show how diversity and the question of national identity lie at the heart of this peace process. What does it mean to be a national of Myanmar in the peace process, and how has the term “national” been understood and used by different sides? What are the common goals of these actors? We hope that having these perspectives in one book values diversity and complementarity as being at the root of the Myanmar nationality. To allow space for reflection for key Myanmar peace process actors on their work and to bring forward the diverse voices shaping this process. The intention is to contribute to the efforts for peace undertaken by the government, the ethnic armed organizations and civil society in the past five years. To document the transition in Myanmar, which has been taking place at a rapid pace and with great complexity. This publication should contribute to institutional memory around the peace process, and aims to document internal processes and dynamics among actors in a context where personal relationships and individual contributions played a large role in moving the process forward. To inform both new national actors and supporting international actors with the knowledge they need to build on previous efforts for peace and the trust that has been established. Especially in the case of international actors, we think substantial knowledge of the particularity of Myanmar’s peace process is essential to best support local efforts. In short, our objective is to value the work of these Myanmar peacebuilders. We are aware that this represents only a selection of views, and that perspectives on the peace process are much larger and more diverse. This book is part of a project entitled “Catalyzing Reflection on Dialogue Processes among Parties in Myanmar” that aims at bringing forward and valuing national voices on the peace process. We hope to continue this project and get additional voices from past, present and future efforts for peace. While the selection of interviewees was a key issue, the editors of this book faced a few other important and difficult questions. How should one tackle the diversity of ethnic armed organizations and their various voices? How can one choose 2 out of more than 20? How can all these different experiences and perspectives be put into only one book? Do the interviewees feel comfortable being gathered in one book? Is this the right format? What about the risk of projecting or overstating complementarity? In order to tackle these questions, and many others, the advice of national and international colleagues and friends based in Myanmar or working in that context for years was taken into account. This publication does not pretend to be neutral, but does strive to be impartial, to value the diversity of views, and to reinforce the notion that the Myanmar peace process needs all these extraordinary hands and heads to move forward. The difficulty for these actors of working together for a common future when history is so loaded is undebatable. Only a few years ago, it would not have been possible to have these views in a common book, which in itself speaks volumes. Although differences and obstacles persist, we hope that the remarkable individuals at the forefront of this transition sustain their common conviction that the goal of peace remains a uniting force. 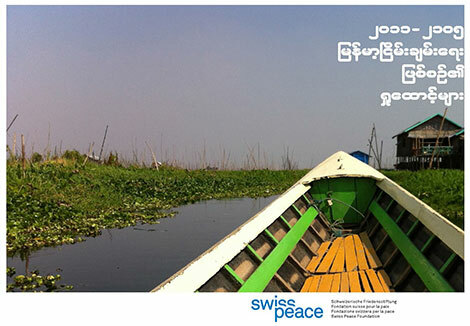 Rachel Gasser is the Myanmar Coordinator & Mediation Senior Program Officer at swisspeace. She holds an MA in International Relations from the Graduate Institute in Geneva. Ms Gasser has previously worked at the UN Department of Political Affairs as part of the team supporting the UN Special Adviser on Myanmar, and later two Special Representatives of the Secretary-General on Somalia, the Centre for Applied Studies in International Negotiations in Geneva, the Swiss Mission to the UN in New York and with UNHCR.